Forget to turn off lights and worry your house security when you are not home. You want to change your room mood easily instead install another one.Lights turn on time. Actually,All you need is One Lombex App and One Smart Phone. Why Choose Lombex Smart Bulb Light ? Personalize your lights according to your mood. Even you are not home,you still run your house with your phone anywhere. It helps to secure your home by setting the lamps on/off at random interval to give the appearance that you're home while your family on vocations keeping thefts away. 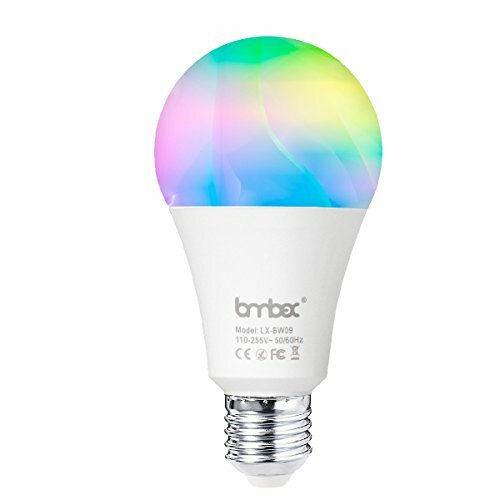 Your favorite Lights Color turn on to wake you up at setting time in the morning and off automatically at night on time when you are asleep. 30 days money back guarantee if you are not satisfied ,noquestions asked. 【SIMPLE QUICK SETUP AND EASY INSTALLATION 】Installation couldn't be simpler . twist in the bulb, turn it on, and sync with the smart app . Easy to setup . No Hub required, install free App which can download via APP store or Google play by search"lombex" . to control this Smart Bulb. During the setup, you are greeted with the option to create a account . One App can control all Lombex smart things, like smart lights ,plugs etc. 【CONTROL YOUR LIGHT FROM ANYTIME ANYWHERE 】You just need to connects to your Wi-Fi and lets you control every aspect of your lighting from your smartphone or tablet. Whether you're home or away, you can always make sure your lighting is set the way you want it. Turn the lights on automatically from your car when you arrive home at night, and make sure all your lights are switched off at your setting time even when you're already at work. 【VOICE CONTROL 】Compatible with your a lexa and Google Home , Control your lights just by your voice. Just ask to command.Work with IFTTT, Personalize your lighting through a color palette of over 16 million hues of color to control its brightness and tones. You can dim any color from dark to bright . You can choose color modes for different scenes, such as reading mode, dinner mode, etc., just at your fingertips or your voice. 【ENERGY EFFICIENT AND SERVICE ANY TIME】20,000 hours lifetime and comparable to a 60W incandescent bulb, save energy and money while looking cool. need help ? Our team is here 24 hours for toll-free technical support, including setup, no matter when you purchased our product. Plus, our 1 year warranty gives you no worry service. kindly contact us for any further information. If you have any questions about this product by Lombex, contact us by completing and submitting the form below. If you are looking for a specif part number, please include it with your message.